Dubai is one of the world's newest and most talked about travel playgrounds. The city's transformation from desert to major destination began just a few decades ago, yet Dubai now boasts the world's tallest building, the largest shopping mall, and some of the planet's most luxurious shopping opportunities. Entertainment here ranges from indoor snow skiing to camel racing. Many of these activities come with extravagant price tags. What follows is a list of ten free things to do in Dubai. Sprinkle your Dubai itinerary with these enjoyable freebies and make your visit more affordable. Jebel Hafeet is a mountain that affords spectacular views of the region, and it can be ascended by foot or by vehicle at no cost. Those seeking spectacular views in Dubai frequently take an elevator to the top of the area's highrises. Burj Khalifa, the world's tallest building, rises 2,717 feet above the city. The cost of visiting its highest observation deck ranges from $35-$82 USD per adult, and long lines also could cost precious time. If that seems a bit too expensive, Jebel Hafeet allows for a much more extensive view, as it is about 16 miles long and several miles across. Hafeet Mountain Road is the winding route that takes you to about 3,900 feet above sea level. If you're willing to brave this potentially dangerous road at night, you can see some terrific views of the city lights. Wafi Pyramids Rooftop Gardens quickly makes the itineraries of budget travelers because it hosts the "Movies under the Stars" events that are popular and free each Sunday at 8:30 p.m. The outdoor theater features beanbag chairs and access to food and beverages. There are other entertainment venues here that will require money. But it costs nothing to soak in the atmosphere. This is also a place for splurge dining. Scores of good restaurants offering Italian, Asian, and Continental cuisine line the passageways. Dubai Mall, in the shadow of Burj Khalifa, is the world's largest mall. That fact in itself makes this a worthy tourist destination, and it costs nothing to survey the vast shopping areas. Inside the mall, your visit will require some planning. This is a shopping center of 5.4 million square feet, with 1,200 stores that attract 54 million annual visitors. The numbers are astounding, but the list of "bests" and "biggest" are under constant dispute from other malls around the world. Look past all those claims and enjoy observing some unique attractions, such as a 10,000 sq. ft "sweet shop," a 245-ton aquarium, and a giant indoor amusement park. To take full advantage of these attractions requires money, but observations are free. Next door to the mall, Dubai's famous dancing fountains are billed as "the world's largest performing fountain." This free attraction resembles the Las Vegas Bellagio show with 6,000 lights and 50 color projectors. The shows run about five minutes in length and are staged from 6-11 p.m. and sometimes during midday periods. Go to the Waterfront Promenade just outside the mall. Gold Souk literally means gold market, and you'll see a variety of products rarely matched elsewhere. The location is 54 Al Khor St. If you're thinking about buying, do your research before arrival. Not every advertised "deal" will work to your benefit. The government does regulate the products, so worry less about authenticity and more about price. Bargaining is common, but knowing the true market value of a piece before buying is essential. It costs nothing to stroll and observe. You'll see gold jewelry and diamonds from this area and other parts of the Middle East and Asia. Ras Al Khor is a wildlife sanctuary that sits at the mouth of the Dubai Creek, and its home to many species of birds. However, it is best known as the place to see scores of flamingos during the cooler months. There is no entry fee. Dubai sometimes comes off as rather plastic and artificial, so this site becomes one of relatively few natural attractions. If you're a bird watcher, it might fill an entire day. For others, it is worth a quick look -- and don't forget your camera. Jumeirah Beach is home to some of Dubai's most exclusive hotels. Guests pay extravagant fees to enjoy top-tier services and the soft sands of the nearby beach. But there's a public portion of the beach that does not require a five-star hotel stay for admission. It's free to use. Enter the public portion of the beach at Jumeirah Beach Park, where you can picnic, barbeque, or just relax. Keep in mind that average summer high temperatures are well in excess of 100°F. Walking on the sand can be a painful experience under those conditions, so bring along some flip-flops or other appropriate footwear. 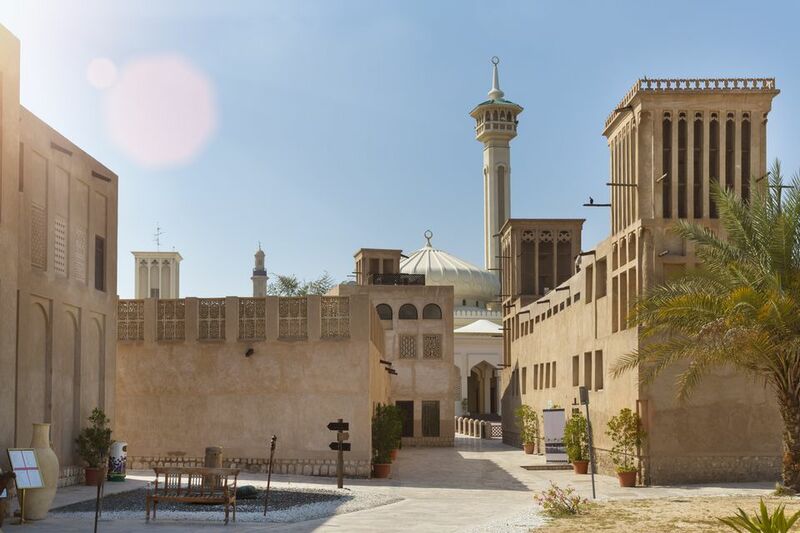 Al Fahidi (also commonly called Bastakiya) is a historical district in the heart of Dubai that brings a glimpse of what this area looked like prior to all the high-rise construction of the past few decades. The neighborhood originally was about twice its current size, but half was demolished to make way for development. Following encouragement from a visiting Prince Charles, the local government moved to preserve the remaining structures. They have been restored to show what life was like here in the 1600s. Narrow alleys and roadways have been recreated, and several small museums are also available to visit without admission charges. Nearby is the Etihad Museum, which does make a modest admission charge of less than $10 for adults. Although not free, it is well worth a visit. The museum traces the development of the United Arab Emirates with interactive exhibits. Dubai by Foot offers free tours during the summer season at no charge, under the philosophy that everyone should have access to a basic understanding of Old Dubai, regardless of ability to pay. As with other tours of this type in the U.S., those with ability to tip generously for a good tour should do so. It supports the people who provide this service for everyone. The tours are available at various times in six languages. The Old Dubai tour covers several attractions already covered here, such as the Gold Souk and the Bastakiya District. The company also offers other tours at low cost. Check for schedules and prices in effect during your visit. This market (Time Square Centre on Sheikh Zayed Road, Saturdays from 9 a.m. -3 p.m.) allows visitors to meander among scores of artisan stalls, where some of the area's most talented craftsmen are represented. Many visitors arrive here not knowing exactly what they'll find, and they wind up purchasing items that were unfamiliar but enticing. Crafts are outside in open-air markets, while some organic grocery shopping can be done through the inside portion. Even if you're not in the market for anything on sale, enjoy a free education about the products of Dubai.